Elisabeth Scharlatt, publisher of Algonquin Books, and Manuel Muñoz, author of The Faith Healer of Olive Avenue, discuss the hurdles and biases Muñoz encountered along his way to publication. Muñoz’s roots in California’s Central Valley and his concern with voicing the stories of the Valley shed light on his process and work. Includes 5 minute Q&A. 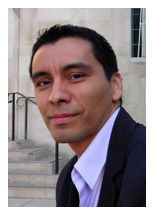 Muñoz reads briefly from Lindo y Querido at (8:14-11:20). This recording is available for noncommercial and educational use only. All rights belong to the author. © 2008 Manuel Muñoz and Elisabeth Scharlatt. Used with permission from Manuel Muñoz and Elisabeth Scharlatt.